Most famous for being chased by the hapless Keystone Cops, Buster Keaton ( 1895-1966) was along with Charlie Chaplin and Laurel & Hardy one of the great comic geniuses of the golden age of silent movies. I certainly spent many happy hours watching his movies. So it is most exciting that the hugely talented James Dangerfield has succeeded so magnificently in bringing Buster to life before our very eyes. His one-man show is a musical biopic on stage featuring film montage projected onto the stage backdrop. It’s a thrilling 50 minutes which sent me away wanting to both rewatch the films and find out more about Buster. James Dangerfield convinces as Buster. 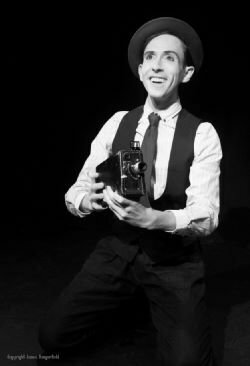 With his face covered in white makeup and wearing the distinctive flat cap, he has captured Buster to a T. The moments in which the action shifts from James as Buster live on stage to Buster in film clips are uncanny. One feels as if the real Buster has walked out from the screen onto the stage. It’s a very convincing tribute. James performs a dance routine involving tap and cane, stops and then we see a film clip of Buster doing the exact same steps. This back and forth dynamic between the onstage Buster and the film clips is what gives When You Fall Down its energy and narrative drive. James Dangerfield really is remarkably talented not only does he perform but he also wrote the book, music and lyrics. Moreover, during the course of 50 minutes he acts, dances, sings, mimes, draws and most movingly gives voice to Buster the man. Like many comic geniuses, Buster was a troubled man and James Dangerfield unflinchingly but sympathetically shows this darker side. In particular, he touches on his alcoholism by having him pour water into a succession of glasses each of which turns purple, green, pink and so on to hint at his excessive drinking. His disastrous marriage to Natalie is literally drawn on stage by a series of three drawings which James makes live on stage in three different sizes of paper to illustrate the increasing size of house demanded by Natalie. The title refers to the essence of the play and the key to understanding Buster. As James so movingly shows for Buster it was imperative that an artist should never reveal his feelings but remain opaque. In this way, he believed that the audience laughed more. This is wonderfully borne out by the clip of the front elevation of a house falling down and Buster standing still. It misses him by millimetres but crucially he shows no emotion. James Dangerfield has performed an important act of homage. He has created a convincing portrait of Buster Keaton that will introduce a whole new generation to the films of one of the all-time greats of 20th-century popular culture. I urge you to see it. Through slapstick, songs and soft shoe shuffle, When You Fall Down follows the triumphs and trials of silent film star Buster Keaton as he makes his iconic movies. As the world whirls around him, with his marriage failing, his best friend on trial, his career in danger and turning to the bottle, Buster must hit his mark as he films the most dangerous stunt of all. When You Fall Down is set in a silent era, but it has many themes that still resound today. The show deals with the 1921-22 trials of Buster’s best friend Roscoe “Fatty” Arbuckle, Hollywood’s first major scandal, with one of its biggest stars hauled onto the stand to answer charges of physical assault. The surrounding furore foreshadowed the MeToo movement by nearly a century. And we also see a battling Buster, fighting to keep his creative independence, his marriage alive and attempting to resist the call of the drinks cabinet. As the show culminates, and these pressures combine, Buster films the façade of a house collapsing around him; a one-take shot where any error would have fatal consequences. Buster’s stoic sensibility through life’s challenges, and perseverance in overcoming obstacles on and off the screen make Keaton seem today the most modern and relevant of the silent movie stars. Music: James Dangerfield, with arrangements and instrumentals by Martyn Stringer.